Mourners laughed at the funeral of Bernard Manning yesterday, as fellow comics cracked jokes in honour of the controversial stand-up. And he wept as he said: 'Bernard, I love you and miss you. 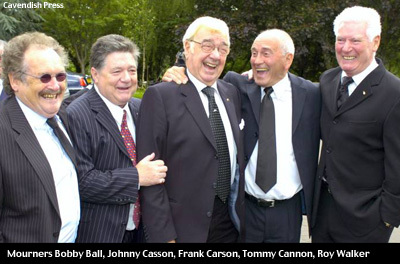 Around 400 mourners attended Blackley Crematorium, including fellow acts Cannon and Ball, Jim Bowen, Stan Boardman, Roy Walker and Roy "Chubby" Brown as well as former Manchester United ace Dennis Law and ex-Coronation Street star Bruce Jones, who played Les Battersby. During the hour-long funeral service, which was relayed by loudspeakers to around 150 people who could not fit into the chapel, the trademark I Laf number plate from Manning's Rolls-Royce stood at the foot of his coffin. Tributes were also read from many who could not be there, including, Manchester United boss Sir Alex Ferguson, Shirley Bassey and Tom Jones. The service ended with Frank Sinatra's My Way. Earlier, more than 500 mourners had lined the streets of Manchester to pay tributes as Manning's cortege drove by. En route to the crematorium, the comic’s horse-drawn hearse pulled up outside his Embassy Club, where the railings were lined with floral tributes. Manning’s closest family and friends returned to the Embassy after the service for a wake. The comic died from kidney failure last Monday at the age of 76.